Ballet class music in MP3 format featuring original piano selections for barre and center practice, including Pirouettes, Adage, Petit Allegro, Batterie and Grand Allegro. Barre and Batterie selections are played twice for classroom convenience. Payment submitted via PayPal (“Buy Now” buttons). Please note you do NOT have to sign up with PayPal in order to use this service; you can submit payment via major credit cards or Visa Debit cards as you would with any secure online payment service. 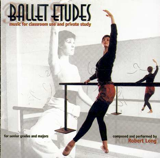 Ballet Etudes Complete Album: $9.95 U.S. If there are any questions or problems with your order, do not hesitate to get in touch with me (go to “Contact” in Menu).